Good Luck for Job Interview: Looking for ways to send your best wishes to someone who has a job interview lined up? An inspirational quote on Facebook or a sweet good luck message in a greeting card could be exactly the kind boost they need to bust this stress. Whether you are wishing a friend, colleague, boss or someone in the family, let your words provide the encouragement and support they need for overcoming their fear and doubts. Lighten up the mood by sharing something funny on Twitter. Be a little cheeky and tweet a video showing tips on being confident and flaunting a good personality in a job interview. You’ll be amazed to see how simple words of motivation can become such a powerful source of strength for someone who is jittery about facing a random set of strangers asking difficult questions. 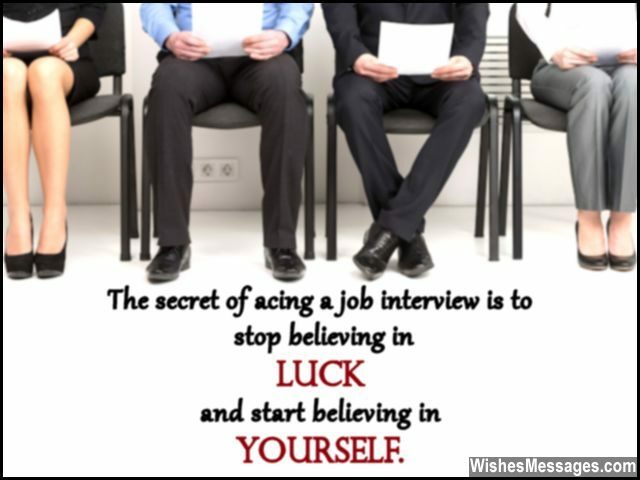 1) The secret of acing a job interview is to stop believing in luck and start believing in yourself. Best wishes. 2) Think of your job interview as a battle in which your work experience is your strategy, skills are your ammunition, nervousness is your enemy and confidence is your ally. Good Luck. 3) Go out there and show the company, for them you are the one who’s meant to be. Good luck. 4) Two best friends that you must take along for your interview – confidence and good luck. 5) The trick to do well in a job interview is to understand that if you don’t get the job, it won’t be the end of the world but if you do, it will change your world. Good luck. 6) Your experience is the Product. You are the Seller. Your job interviewer is a Customer and your interview is a Deal that you must make. Good luck. 7) A ten minute slot– that’s the time frame to show them what you’ve got. Good luck. 8) If you believe you will get the job, you’ve got it already. All the best. 9) May luck be by your side and confidence be in your stride. 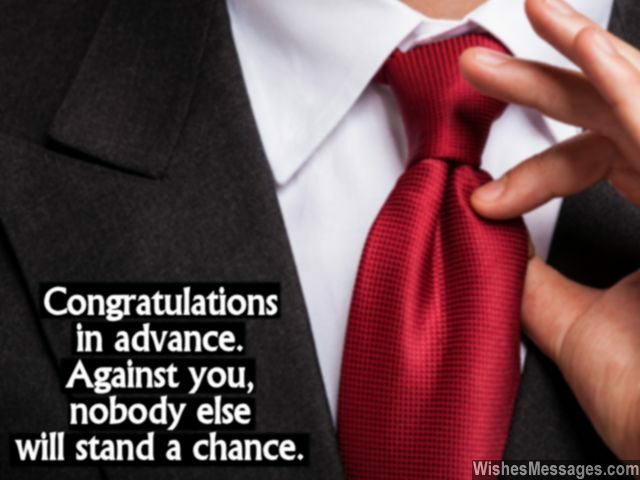 May you finish your job interview with success and pride. Good luck. 10) If bagging a great job seems very tough, to succeed you’ll need to want it bad enough. Good luck. 11) Bagging this job will be a life changing experience, but if you don’t get it, your life won’t change. So relax and do your best. 12) Only the best things happen to best friends like you. Best wishes for your job interview, hope you give it your best shot. 13) Your fate is in your hands, not in the hands of your job interviewer. Good luck. 14) Your college degree may give you a foot in the door, but impressing your interviewers is the only way you’ll really score. Good luck for your first job. 15) You can prepare well but if you don’t present well at the interview, you won’t get the job. You will never be able to present well if you don’t prepare well for the interview. All the best for striking a balance. 16) Congratulations in advance. Against you, nobody else will stand a chance. Good luck. 17) As long as you are honest, you will be the best and pass this acidic test. Good luck for the interview. 18) Don’t look at your future job as being larger than life. A job is only as large as the person chosen to do it. All the best. 19) Will I be good enough for the job? Will this job be good enough for me? Two different attitudes – you choose. Good luck. 20) The success of your job interview will be the first peak of your victorious career graph. Good luck. 21) Your job interviewers don’t know how lucky they’re going to get today. Good luck. 22) The toughest thing to handle in your job interview won’t be the interviewer or the questionnaire. It will be your own self-confidence. Good luck for your new job. 23) You are the perfect candidate, the best that a company can ever get. Good luck. 24) Forget about acceptance. Forget about rejection. Focus on what’s in-between – your interview. Good luck. 25) You don’t need to prepare for your job interview – your life has been your biggest preparation. Good luck. 26) In front of all the mammoth battles you’ve fought in your life, your job interview is a dwarf. Good luck. 27) You are a success story in-waiting. Good luck. 28) Your interview is just that start of your story, much success in your life you are still yet to see. Good luck. 29) Your job interviewer’s questionnaire will be one of the first steps in your journey of becoming a millionaire. Good luck. 30) Your job interviewers should get ready to receive the best surprise of their lives. Good luck. 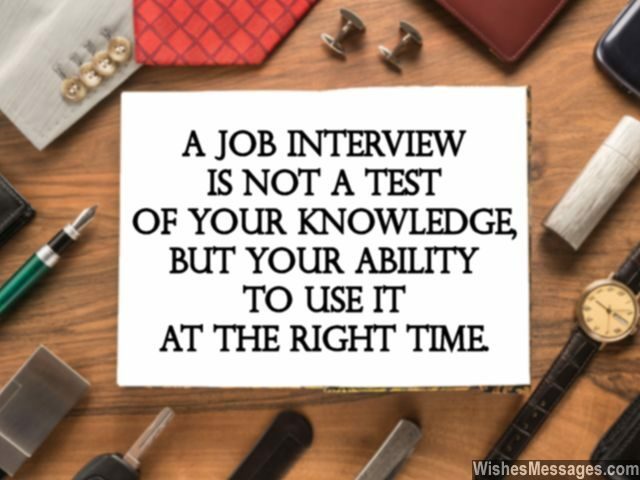 31) A job interview is not a test of your knowledge, but your ability to use it at the right time. Good luck. 32) Graduates only have degrees, but you have the biggest qualification of life – dedication. Good luck. 33) A job interview is just a little pebble in the garden of your life which is lined with flowers of success. Good luck. 34) Don’t e nervous and don’t fret. You’ll bag this job in a jiffy, I bet. Good luck. 35) It’s a job interview, not a rocket science exam. All the best. 36) You don’t need good luck, you need a wake up call to realize that you’re already a winner. Good luck. 37) Right now, I am wishing you good luck for getting a job. Very soon, I will be wishing you congratulations. 38) A job interview can determine if you are good enough for a job or not. But it can’t determine what a talented person you are. Good luck. 39) The first time is always awkward for everyone. Good luck. 40) You shouldn’t be afraid of the job interview. Your interviewers should be afraid of assessing a talented candidate like you. Good luck.